It does not matter how much I have cleaned my pasta machine, inevitably I end up with smears, marks, and other “random” colors of clay from previous projects on my slab of clay. Yuck. I hate it when this happens … sadly it happens to me every time I clay. Now, the point could be argued that I have no idea what I am doing. This could be true, however, I would argue that one. Here’s the more likely scenario … It just happens! And I’m sure it’s happened to you. It happens to me often because I don’t let any clay go to waste. I even use that old, “unusable” hard clay! This being said … my clay slabs that I roll through my pasta machine, often have “clay muck” (this is my term for unwanted clay “bits” that get into my clay and make me go “yuck”). Those hard little tiny bits that get “stuck” in my rollers seem to “break loose” right when I don’t want to see them. And I’ll be honest, it happens a lot. When that happens there’s no need to fear. Here’s a few quick & easy tips to prevent this from happening. Clean your pasta machine rollers between colors. Always condition clay from lightest to darkest and not the other way around. Keep a hunk of “scrap clay” to run through the machine in between colors to pick up those clay bits and streaks. Make sure your clay isn’t too soft! Here’s some help for those times that the clay still ends up getting onto your light colored blend (of course)…. Don’t panic and see where those bits are. Grab a sculpting tool with a spoon thing on the end (yes, “spoon thing” is a technical term…). Lightly “shave” the color bits off your clay. You should have dent marks in the clay, but no more bits of color. Continue to fully condition through the pasta machine. OH! 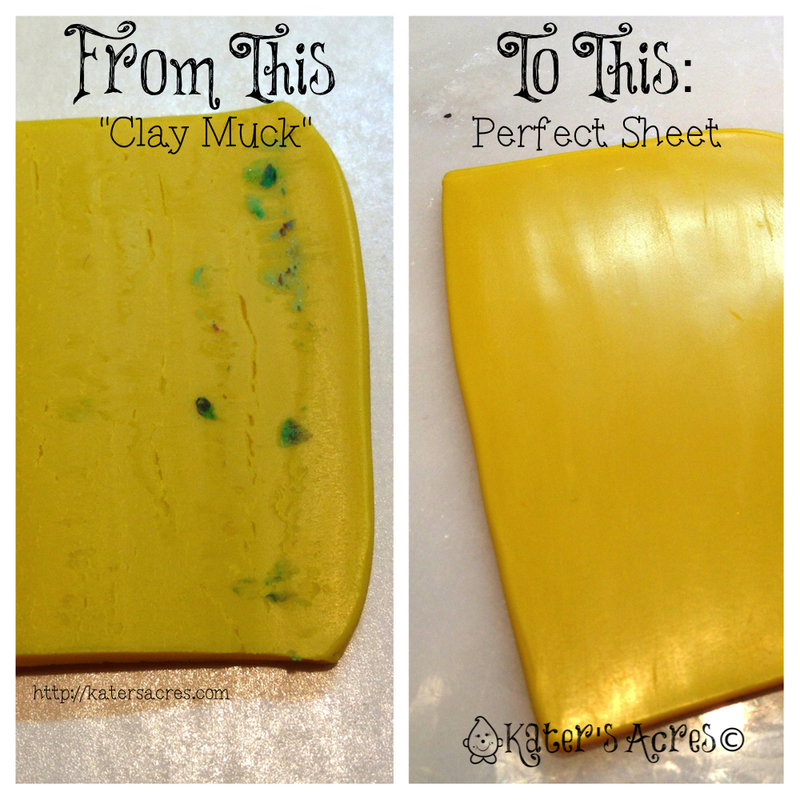 And in case you are wondering, the sheet pictured at left is the same sheet in the “clay muck” photos, just fully conditioned Premo polymer clay with all that “clay muck” removed…ready to be made into a Parker! I find that just running a damp paper towel or a wipe through the machine, helps keep it clean. Yes, that certainly does help … but it does not stop the buildup from getting stuck under the scrapers of the pasta machine. You will still get buildup over time. I Took off those parts underneath the rollers where the clay seems to collect. You have to Remove the one side edge where your handle and clamp fit onto the machine. It isn’t real easy but it did solve my problem and made cleaning the rollers much easier also. Yes, that will solve the issue too Mary Beth. Some of the clay machines are not that easy to take apart and once you take them apart it’s hard to get them back together. This is just a really quick and easy way to do it. Albeit your way solves the problem more permanently. That works GREAT for the surface of clay, but other clay that has coming through rolling through a pasta machine is embedded into the sheet and will take more than this method to remove. I am new to PC. I learned the above tips by trial and error. Another thing I did was buy a second “pasta” machine. I had just joined WOOT and they had some for about $20. They have stainless steel rollers, I am not sure if that is good or not, time will tell. I bought two at this low price, one to dedicate to white clay and then a spare for future use. I think most times you can get away with mixing slight bits that you cannot shave off, but I wanted to keep one for pure white and translucent white. I was amazed the first time I cleaned my pasta machine. Lots of bits were accumulated in it. Yuck. Two pasta machines is a great idea Ann Marie! I don’t have that much room in my studio, but if I did, I’d definitely be doing it too! Congrats on the great find on Woot as well. Woot is a great place to find stuff! THANK YOU Katie! It’s so encouraging to know that a pro like you still struggles with the same problems that us newbies do! I have been using the sculpting tool to remove my “yuck” but I assumed the problem was me! I also assumed it was because I couldn’t afford a fancy pasta machine! This is such a relief, I’ll get by w/ what I have for a long while yet using this advice! So kind of you Teresa. I am hardly a pro, but I do LOVE clay & working with it. Unless you remove the covers from your machine so you can easily access the blades, this will happen all the time. I used to get upset about it, now I just know how to deal with it. I constantly get smudges but not horribly. I just keep rolling it through the pasta machine until it blends into the original color. I’m not super picky about the colors I need and if it changes slightly from the original color, that’s ok. Thanks so much for tip, I really appreciate i!!! Thank you so much Katie, for these suggestions. Yes, it happens every time with me too. I try all the cleaning tips you mentioned, I even have a roller especially for white only, but I still get all the other colours with blobs on them. Just glad I’m not the only one !!! Thanks again. You’re welcome. I’m glad this was helpful to you! Hi, Katie. I’m having a problem that I can’t figure out how to fix. It seems that no matter how many times I run my scrap clay through the machine, I still get black, kind of oily smears on the clay that I’m trying to condition. I’ve tried cleaning it on it’s thickest setting, it’s thinnest setting and every setting in between. I must run the scrap clay through 20 times, making sure to hit every piece of the rollers (especially the part closest to the sides). I can think it’s clean and then the next thing I know, there are black smears all over the good clay that just ran through. I’ve tried cleaning it with a baby wipe, even tried running the baby wipe through and it just comes back. – Using a baby wipe, RUB the rollers while turning. – Add corn starch to the baby wipe and rub it in a little, then repeat rubbing the rollers while turning where the streaks gather. This will help soak up the oil. – Use SUPER SCULPEY to pick up the oil. It will pick it up and remove it from the rollers. I keep a hunk right under my machine and use it to catch bits of clay and clean the rollers. Just continue to roll it through the pasta machine about a dozen times and it will work for at least a few hours. Yep, this is a good idea. But, I think I can go one better. If I find blotches on my clay, I use a cloth dipped in alcohol and I rub off the smears. Much less waste. That works too, but it also tends to harden the clay and begin to cure it yielding it not as workable. I’m glad you enjoyed it and learned something – thank you for joining me! The blade works too for this, I just find I generally take off TOO much clay when using the blade. I get “extra pieces” in my blends when they aren’t fully conditioned because the clay is so much harder. Renee, Mona Kissel sells modified pasta machines that have thumb screws to remove the roller blades. http://monakissel.com/ I bought one last summer and LOVE it. I probably clean my blades once or twice in every project. Thanks for sharing the information Sandy! I’ll go check it out. Thanks so much for sharing this! I was starting to think I was the only person it happened to! You are welcome – I hope it helps you!